Battery life is absolutely key in smartphones, and it's damn important in laptops too (doubly so if you're interested in one of those fancy new tablet-laptop convertibles). And we're about to get a bunch of it. Thank to Haswell, this next generation of laptops will not only have more battery power, it'll have a ton of it. We're talking ultrathin ultrabooks that last 24 hours on a single charge, or up to ten days of standby power. Nothing on the market today comes close. That increase in battery life doesn't mean you're going to be sacrificing power; quite the opposite. Haswell chips will let new laptops do way more with way less. The specifics of all this is still very hush-hush, but suffice it to say that the top-flight ultrabooks that will be rolling out these next few months will be significantly faster and more powerful than the one you have, with a longer battery life to boot. It's two bonuses for the price of one. Speaking of performance advancements, Haswell is also bringing an awesome new brand of integrated graphics to the party. Iris graphics, as Intel is calling them, are twice as good as those wrapped into last year's chips, which were already a few times better than the plenty respectable ones that came a year before that. Just like with battery power, this isn't just a jump; it's the biggest jump ever. In short, Iris will let you play new, current games—like Modern Warfare 3 or Bioshock Infinite—on your ultrabook without getting a separate graphics card. And it can handle 4K video output, which is going to be important a few years down the line once this new ultra high definition tech catches on, and the monitors that support it get a little bit cheaper. Future-proof! Don't hold your breath for a MacBook Air with an Retina display any time soon, but chances are both the Pro and Air lines will get updated with Haswell goodness at Apple's Worldwide Developers Conference this June. You should be able to order them right when they're announced. The release of Windows 8 last year spawned a wave of innovative tablet-laptop convertibles that hasn't let up since. Those won't be going away, but Haswell's power-efficiency will make tablet-modes much more dependable, especially for the ones that physically detach from their keyboard base. Laptops that turn into tablets are finally going to have tablet-like battery lives. And that's not all: this next crop of ultrabooks will be thinner and have touchscreens, so no more grabbing at unresponsive displays out of habit. And even if a touchable display isn't something you're into, the good ol' fashioned non-touch screens will get the Haswell boost as well. 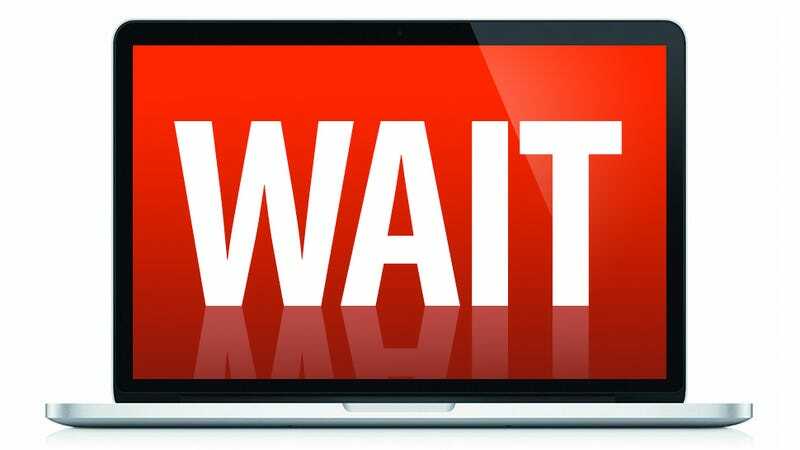 You should still wait! Even if you've got no use for the new hotness and would rather get your hands on some slightly out-dated hotness, the introduction of new-laptop-kids on the block will shove prices down for previous generations. Apple users will see an influx of heavily discounted refurb store stock, and last year's PCs will be on perma-sale at any big box you go to. So unless you have no patience and actively hate your money, cooling your jets for just a month or two is the right choice, no matter what you want. It'll be worth the wait.